Lea Michele is returning to TV with her new show 'The Mayor' and on Saturday(September 23rd) she attended the ABC Tuesday Night Block Party in New York. 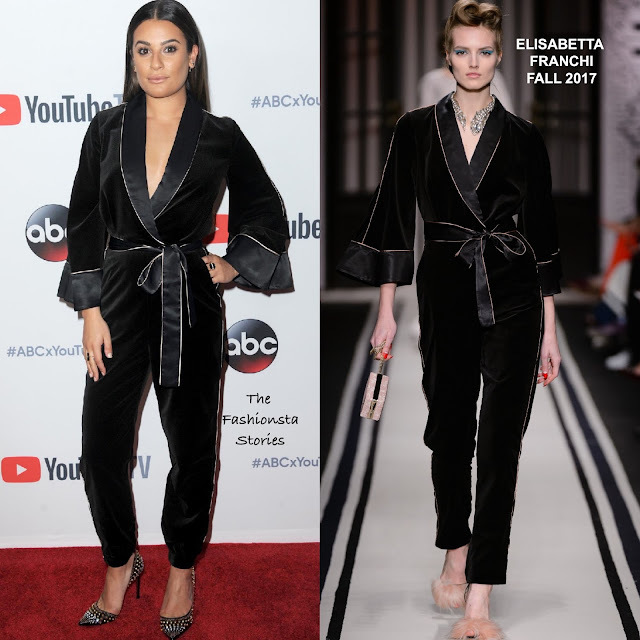 Utilizing the pockets on her piece, she wore a ELISABETTA FRANCHI FALL 2017 black long sleeve velvet jumpsuit with a satin panels, a shawl lapel collar and a tie waist. This jumpsuit offers up a different take on the popular pajama trend. Instead of wearing sandals with her jumpsuit, she give it an edgy touch courtesy of her CESARE PACIOTTI black crystal & studded pumps. Minimal make-up and center part, straight off-the-shoulder tresses finished up her look. Are you feeling Lea's look?